KALININGRAD, Russia (AP) England barely seemed troubled by losing. Belgium appeared to be a reluctant winner. Such was the curious conclusion to the group stage at the World Cup on Thursday. Neither team needed to win and there was good reason for neither to even want to win. Belgium did collect the three points, beating England 1-0, and secured first place in the group on Adnan Januzaj’s curling shot. But that might not turn out to be the desirable outcome since the victory diverted Belgium onto the tougher potential path to the final. Although Belgium gets what appears to be an easier match against Japan in the round of 16, it could get trickier with a victory in Rostov-on-Don on Monday. Brazil, Portugal, France and Argentina are possible future opponents. Thanks to a pair of opening victories for both, England and Belgium entered the Group G match knowing they were already in the second round. Belgium made nine changes and still won. England lost the top spot after dropping Harry Kane, the tournament’s leading scorer, and seven others. England coach Gareth Southgate could barely contain his delight in finding himself on the less challenging side of the draw. His team will face Colombia on Tuesday in Moscow, followed by possible matchups against Spain, Russia, Croatia, Denmark, Sweden and Switzerland. For Southgate, it was as much about ensuring players like Kane did not pick up injuries in a game that wasn’t essential. The leading scorer in Russia with five goals watched the match from the bench. So did Romelu Lukaku, who has scored four for Belgium. What could have been a tantalizing match between two strong European teams turned out to be a bit of a letdown. England goalkeeper Jordan Pickford made an early save on a shot from Youri Tielemans. And after a fumble by Pickford, Gary Cahill made a goal-line clearance. On the other end, Kane’s replacement up front for England, Jamie Vardy, tried his luck with a header. 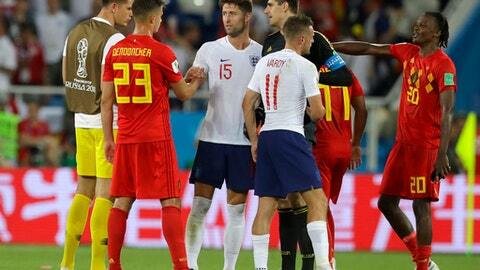 Marcus Rashford came closest for England at the start of the second half but his low shot was tipped around the post by Belgium goalkeeper Thibaut Courtois. If the script was to avoid winning, Januzaj didn’t read it. Picking up possession on the edge of the penalty area, he shifted the ball around Danny Rose and curled it into the corner of the net in the 51st minute. Januzaj was briefly one of the most talked about players in the world when he scored twice in his Manchester United debut in 2013. There was even talk of him becoming eligible to play for England on residency grounds. Januzaj opted for Belgium, but his career faltered. After a detour at Borussia Dortmund and Sunderland, he found a new home last year at Real Sociedad. England ended up with the potentially more difficult match in the round of 16, even though the country’s national team hasn’t won a knockout-stage game at any tournament since 2006.